On twitter I once wrote a very basic short article on how Barcelona can be so fluid without having too many or too complex instructions for each player. You can find this here. Let’s create something similar for the system we just created. ・If the central back / sweeper is supporting near the ball, move away. Position yourself in the gap between the center back and side back just 20 meters deeper. 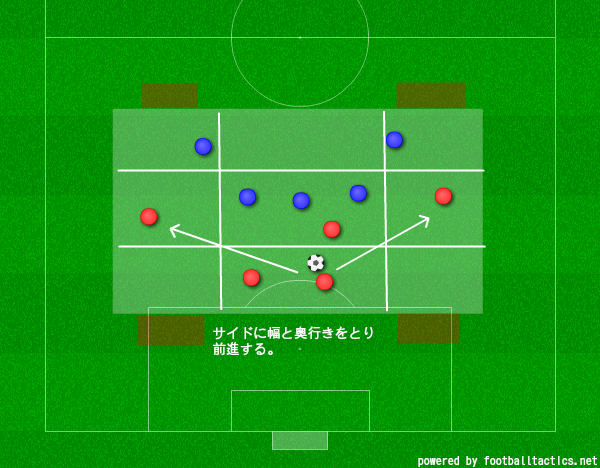 ・If the central back / sweeper is supporting away from the ball, move towards the ball. Offer yourself for a simple back pass. When you receive, try to already face where you want to pass next. Check your surroundings always. If you don’t find a passing option, go long towards the sides. ・Use hand gestures: If you have space in front of you, show with your hand you want the ball in front of you. If you are not sure, point with your hand towards your feet. ・If the back line advances, advance with them. Keep 20 meters distances to them but always be active. Try to intercept long counters behind the back line or prevent them by helping your team mates. 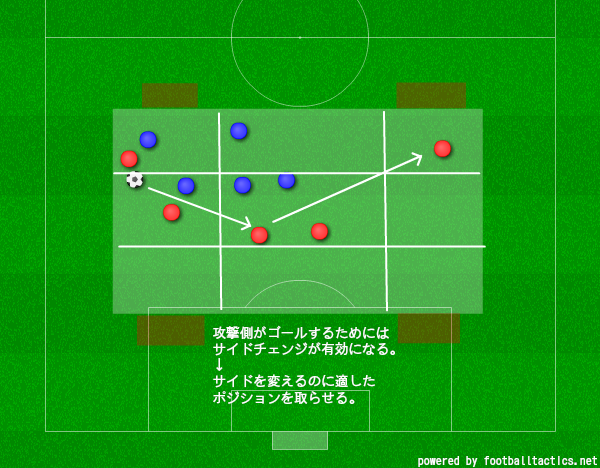 ・If the ball position changes in the oppositional half – no matter who has the ball – move towards the ball. ・Don’t position yourself with the side backs in one line in possession. If you do that, you cut their connection and make smaller space. Try to be a few meters deeper. Imagine a diamond or pentagon with the side backs and central midfielders! With this, the opposition needs to cover more space in pressing. ・If you get pressured from the side or don’t get pressured at all and there is space in the midfield in front of you, you are allowed to advance. ・If you feel our build up is too passive, move towards the right a bit and instruct the left holding midfielder to drop deeper. ・When passing to the side, always look diagonally behind you after that. You should check if there are players in the passing lanes to the other side back for switches and if the middle is open for passes there if you should get the ball back. ・If you face the whole field, look for diagonal passes towards the wing. There we have the positional switches and can get a free man with dynamical superiority. 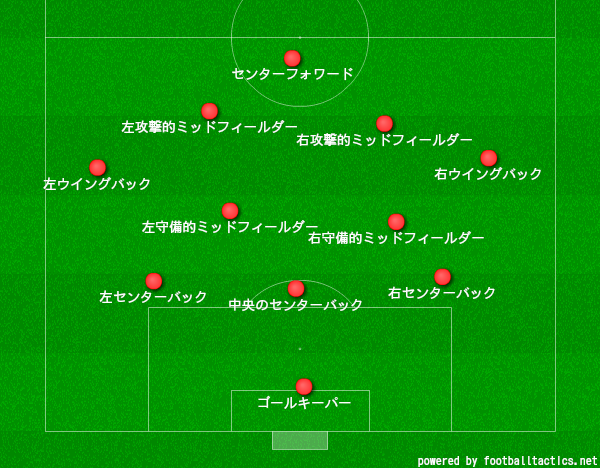 ・If the Central Back advances, check if one of the central midfielders is dropping. If not, move 10-15 meters towards the middle to create a back two for cover. ・When we get the ball and secured it, immediately split and make the pitch big. Don’t position yourself in a horizontal line with the central back / sweeper. ・If there is space in front of you, you are allowed to advance. ・If there are two players in the middle – as in a midfielder dropping deeper – you should advance forward. ・Before receiving position yourself so you face the central spaces and always try to look towards the highest midfielders so you have the most information input for your possible passes. If you play it to the wings, try to do it directly! ・You are allowed to position yourself in a line with the central midfielders but only if there is still an open passing lane to your central back and you are not too near to the wing back in front of you. ・Only move towards the middle when we have possession if you think we will lose the ball soon or your support in the middle is the only option to stay in possession. Otherwise stay wide. ・If the central back advances, move towards the side to open space. Move backwards so you still have an open body posture towards up front. Look around you so you don’t get pressured from behind. ・If you don’t find space in the middle, drop deeper so the side backs can become full backs. Try then to either find them or the central midfielders. ・Don’t move too far to the sides. Always stay in front of the gap between the central back and the side back. Only move to get free and to escape oppositional access. ・Turn if there is a vertical or diagonal pass to the players higher than you; you should be able to receive lay offs from them and then distribute forward again. ・Try to have an open body posture towards the right side; with this you have a good overview of many players and can also distribute it long. ・Don’t initiate positional changes with the right wing back if you are potentially able to receive the next pass. If you feel you won’t get the ball and can’t get free, you are free to initiate positional changes with the right wing back. ・Don’t be in one horizontal line with the right wing back. Try to be in a line between him and the right side back. ・If you pass to the middle, look toward the right side to see what your partner is doing. If he gets a pass (especially from you), immediately look towards the middle so you know where you could pass to if you receive it back immediately. ・Never be further away from the right wing back then 20 meters, except your partner in central midfield has dropped deeper. Then move towards the middle to occupy the space in front of the gap between him and the central back / sweeper. ・One great situation to change positions is when we circulate on the opposite side and pass it back. Now you can move towards the wing and he can advance into the middle. Look at your partner and create eye contact when changing position! ・You are allowed to advance through the middle and towards the oppositional box, attack open space in front of you if you see it. ・Look at your partner and create eye contact when changing position! One great situation to change positions is when we circulate on the opposite side and pass it back. If you feel you saw open space in the middle and you are not able to receive this or the next pass, move into the open space for a positional change. ・Don’t be in one line with your partner. Try to be positioned higher so you also open space for the side back. Move laterally into the middle or diagonally towards goal, if the side back on your side advances. ・When passing it forward, immediately look towards the middle. When passing it backwards, immediately look forward. ・If you pass it diagonally into the middle, advance on the side. If you played it vertically on the side, advance diagonally through the middle. ・When being on the ball or engaged in a combination, move into the middle. This creates an overload and chaos for the opponent while our shape allows us to cover this. ・Only move towards the middle when we have possession if you think we will lose the ball soon or your support in the middle is the only option to stay in possession. Otherwise stay wide. If your partner advances, fill in behind him and stay deeper if needed. ・Don’t be positioned in a horizontal line with you the left wing back besides you, your partner. Try to be higher. ・Keep at least 10 to 15 meters distance vertically to the holding midfielder behind you. If he drops deeper, you are allowed to drop a line deeper. If the other holding midfielder moves centrally, you don’t have to. ・You can move towards the sides to get a vertical pass from your wing back. He should move into the middle then; try to find him or the centre forward with a pass. ・If the central forward is on the right side, you can advance to occupy the last line. ・Look around before receiving; when you pass to the side, immediately look towards the middle and look for the other central midfielder. If you pass to the middle, look for the central forward and the wing back. ・Don’t be positioned in a horizontal line with you the left wing back besides you, your partner. Try to be deeper. ・If your partner drops, you should advance. If the side back on your side advances, move towards the middle or into the last line. If you pass it diagonally into the middle, advance on the side. If you played it vertically on the side, advance diagonally through the middle. ・Look around you; if there is open space and our team has no passing option, fill it and act as distributor. ・Keep about 15 meters distance vertically to the holding midfielder behind you. Imagine it as opening space for him! The oppositional players in the middle should always have to question themselves who to mark. This means only occasionally move into the last line so the centre back of the opponent won’t just start to mark you. If this happens, roam towards the side or slightly deeper. 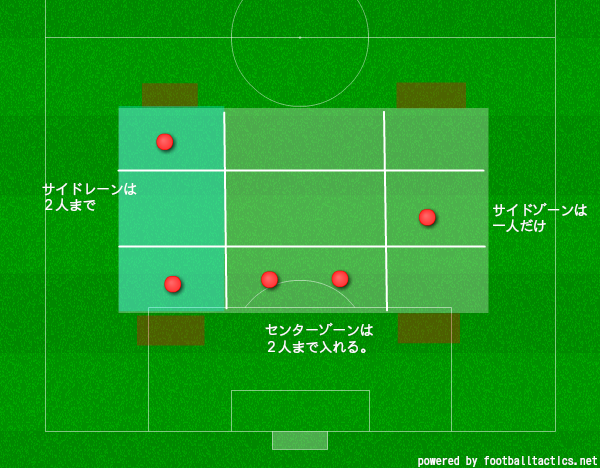 ・Don’t move towards the left side and don’t occupy the same spaces as the left central midfielder. ・Move towards the side where the ball is. Open space by moving towards the wing (opens gap between the centre backs of the opponent) or occupying their sweeper (if your man marker tracks you there which opens one side up). ・If they play with a back four, occupy the space behind their full back if he advances or the channel between full and centre back. ・Try to run horizontally towards the ball side and look for long balls behind their defense into space with abrupt vertical movements into gaps. ・If there is space open, you are allowed to drop but try to do lay offs and immediately turn and go into depth with speed again. ・If one of the central midfielders advances forward, you can drop deeper into the opened space to lose your marker. ・Before receiving, look around your shoulder. After passing, do that again. Try to find an open man for possible break through and so you can get through balls yourself. With this we have covered with a few simple instructions which we can coach our whole system which as a whole is fairly complex. We are able to use it for coaching and it makes the players immediately understand tactical aspects due to the consistent reference point we use. ・If we lose the ball, immediately press the ball. Run towards him in full speed! If you can’t reach it, still move towards the ball and cover for your team mates. ・If we lose the ball, don’t try to get to your nominal position; go to the nearest position in our system. ・Imagine our system as a net or chain; if someone moves out, we follow him and move towards the gap. ・Keep short distances and compactness (this should be focused in training sessions especially to really keep them consistently and so the players know which distances are meant). ・First focus on the ball, then on your team mate. If the opponent near you is not having the ball or being the next player who will get it, ignore him. Additionally to these guidelines I’d personally create some game forms for specific aspects, go through some situations explicitly and of course correct within the drills, at times using freezing. The drills and methodology is important but won’t be covered in detail here. In Germany Marco Henseling’s and my coaching book – incl. interviews with Robert Matosevic, Marti Perarnau and Roger Schmidt – got published in winter. There we talked about periodization, basic strategical and tactical aspects, pedagogy and didactics, technical training, forms of learning, etc. etc. A small graphic illustrating the hierarchy between these aspects; top to bottom. Basically, being “football specific” is the base. Everything you do should be extracted from the game and its principles itself; not the opposite. Many go the other way and do weight lifting because “you need power too in football”. That’s the wrong starting point in my eyes. Football specific comes from the game itself. If you do that as base, there are four basic things which have to follow. The drill has to be holistic; should train as many aspects as possible as the game itself never has an isolated aspect to it. There’s always context. Try to make an image of the game in your drills and put everything you can coach for an action into it. But these aspects have to interact with each other, as they do in the game. That’s “complexity”. The simultaneous interaction between the aspects makes it complex. The complexity should be arranged in a way it makes the whole thing more than the sum of its parts (“synergistic”). Every decision in the drill interacts with what happened before and what will happen after; the possible consequences of the next actions are part of every decision! Then it should be flexible and varying every time with every repetition. Not repetition should be the exact same. That’s “differential”. 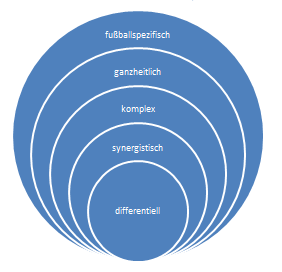 These principles are based on sports science, the talks with elite coaches, among them the interview(s) with Roger Schmidt and our former work from Spielverlagerung with Thomas Tuchel as analysts. Note: This does not mean that everything else is ineffective; it’s just the way I deduced so far for myself to be working best based on personal experience as coach, talking with coaches, analyzing methodologies and the newest input from sports science reflected on the game of football. It also does not mean that there are no instructions from the coach; they are put into the session through talks with the players, explanations, freezing, video analysis (if possible), the session design and the patterns created based on the session design. Also we had more than enough instructions in the last part of this article, right? 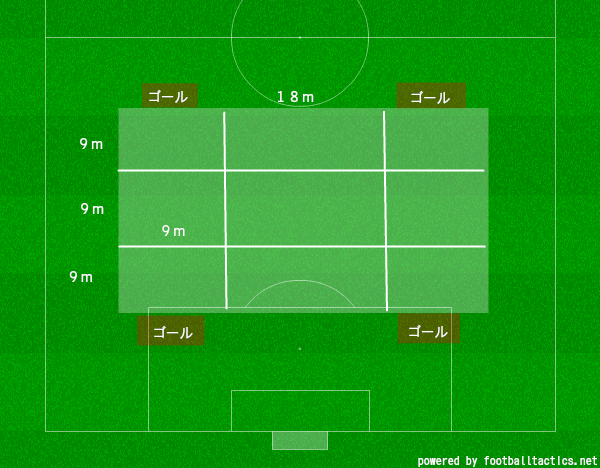 The size of the field should be 24m length, 36m width. Using cones on the pitch we can mark a 3×3 grid; the central zone is twice as wide as the side zones. So the zones are 9x8m three times on each side and 18x8m three times in the central strip. On both ends there are two goals each, on the sides where the middle bordered on the side strip. The teams have two different instructions based on the Priming we want to accomplish for our game model of the 3-2-4-1/3-4-2-1. I would put up one team to play in a 3-2-1 and the other team in a 2-3-1 or in a 3-2 versus 2-3. In the latter example we would have the central back, wing backs and centre midfielders in one team versus the side backs, holding midfielders and center forward in the other. The rules of this game could be for instance specified like this: Maximum of two players in the same zone in the middle strip, maximum of one player in the same zone on the wing, a maximum of two players in the whole wing zone on one side. To this specific instructions for the players are added. Instructions: At the beginning we could say that a back-pass option is always important to leave pressure and being able to switch. The side backs should be positioned at the edges of their zones; basically copying how they split in the game and the ability to advance when one of the central midfielders drops. When they see this (remember the basic system instructions?) they have to split wider and go into the wing zones, advance if necessary / possible. In the 3-2 we of course have our central back building play and the wing backs already higher in before. The wing backs should always occupy width and not move to the ball, so we can switch the sides when needed. The central players are free to move, but could change their position and occupy the wing, drop or advance. As per our “non-negotiable” strategical aspects we play with immediate pressing and for regular pressing they first have to position themselves in their shape in the central zone – and only in that! – with all players. This gives them high compactness and forces them to move towards the ball. The two goals on the sides – instead of one centrally – not only force the team in possession to switch the sides fast and frequently but to play diagonal passes behind and move with the team out of possession forced to always give cover and defend the paths to the goal properly. One false movement or lack of connection to the team mate would open space for an immediate through ball. Coaching points? I actually did this with my team to test it. First started coaching towards high intensity in passing and pressing, rarely focusing on technical aspects and later on – when intensity was high and the rules were understood – I praised right decisions and did not correct as much first. Then I started to correct some positions and explained them. In the breaks (periodization of the drill was 4x8min, 90 seconds break) I gave short explanations and feedback through asking questions about specific aspects. For instance on dismarking and movement of the side players; the left side back for example had problems in terms of movement to open space for himself or others which we went through in front of the team shortly. Later he had better movement and some interesting overlaps and diagonal dribbles into the middle. The left wing back of the 3-2 team was brilliant; he gave depth well, sometimes tried to get a diagonal pass behind the defense, always staying on his position, a few times changing intelligently into the middle and sometimes dropping deeper to build up from deeper zone with more space and time. The last repetition was very nice; there were many on one side, then diagonally to the central players who laid it off to the back line who immediately switched with one pass to the other side with immediate movement and support. Thus, the movement was self-initiated. According to our Priming they started to do more fast shifts, had flexible build up situations and later on started – thanks to the coaching – to change the positions. The right wing back was initially static, later moved often to the center and once ended up on the left; ultimately even against the ball the positional changes started to become functional. As I coached from outside explicitly to “not move to the original position, but the next!” this became better later on. Athletically, the impact was also high and the players had many actions, many sprints and seemed fairly exhausted. All in all the players gave good feedback and there were small but visible steps towards our Priming made. Sessions like these can – with additional drills to support this, the instructions mentioned above, some visualizations and proper coaching – lead after some time to the game model we created.